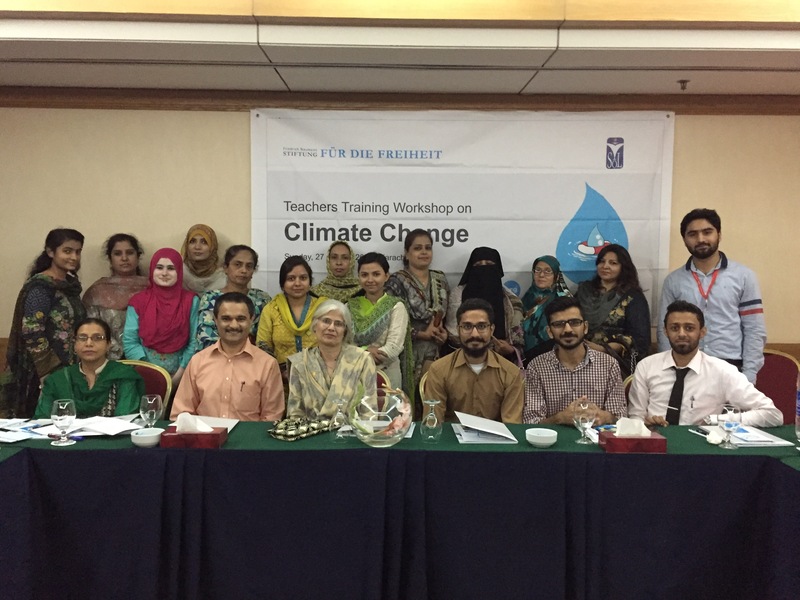 On Sunday 27th August, National Volunteer Programme collaborated with FUR DIE FREIHEIT, German non-profit organization, for their Teachers Training Workshop on Climate Change at Movenpick, Karachi. Understanding the sensitivity of the Climate Change issue, NVP got onboard with FUR DIE FREIHEIT in order to successfully pull off their training workshop. Our team coordinated with NVP partner institutions including: Zindagi Trust, Street to School, RLCC and Kiran Foundation, in an effort to get teacher working in these institutions trained at the event so that these teachers could decimate their learning onto the students. To our delight, all 17 teachers referred by NVP attended the training and made the workshop vibrant. Lead by Ms Afia Salam, Journalist and Climate Expert, and Mr Aamir Amjad, Programme coordinator, FNF, Program Agenda was very well defined. Commencing from the basic concepts of Climate to different aspects of climate change as to how it affects the Human Beings from all walks of life. We learned that the effect of climate change can be observed in both short-run and the long-run. The disturbance created by the Climate change could go beyond the individuals and to entire economies as it can distort employment and migration patterns. In addition, the subject of Climate Change is not constrained to individuals belonging to the field of environment but its scope is much wider and should be studied by marketers, architects, engineers and teachers. For instance: In a reported incident, a certain area was vulnerable to heavy storms not taking this into account, marketers placed heavy billboards on great heights that crushed people beneath them when the storm hit that area. Similarly architects could use materials that are resistant to such disasters. In this century where commercialization is at its height, the significance of environmental studies is quite evident. Undoubtedly, as NVP representatives at the event, we could say that there exists a dire need for such training workshops as they do not only create awareness but provide a framework that should be implemented in our surroundings in order to minimize risks by taking precautions and having a proactive approach, to have sustainable development, and to thrive as a Nation, well informed of climatic changes. The workshop ended with refreshment and certificate distribution to the participants. There was much to take away by the attendees. In the conclusion, we would like to Thank FNF for creating such learning opportunities, and we also present our gratitude to NVP partner institutions: Zindagi Trust, Street to School and RLCC for being highly cooperative in this regard. I am a teacher educator in Belize who is planning to work with teachers to sensitize on climate change. Can you share the agenda for this workshop please. Ma’am, this coverage talks in detail about the Agenda of this workshop.